WATCH VIDEO BELOW TO SEE & HEAR THIS FANTASTIC CARD! 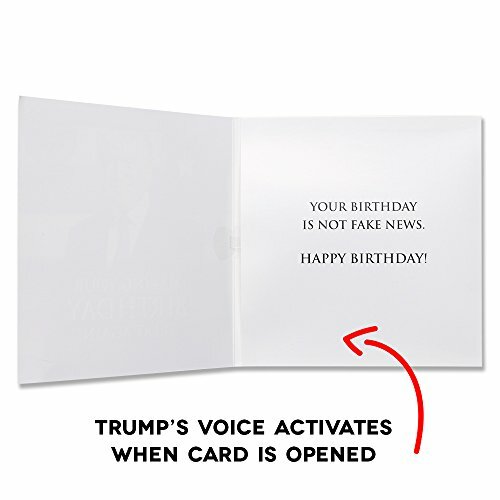 Scroll down to "Related Video Shorts" and watch "Trump Birthday Card" Yes, it's really President Donald Trump's voice wishing you a Happy Birthday! One of the best holiday gifts to create laughter and fun for friends & relatives. VOICE ACTIVATES WHEN CARD IS OPENED! 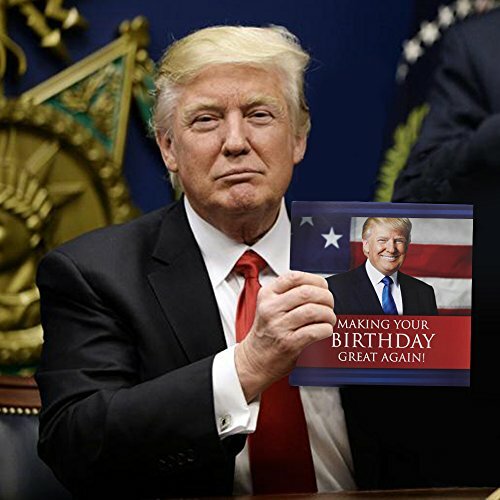 Create big laughs when someone opens this funny birthday card and suddenly hears a recorded bday message of Donald Trump's booming voice saying: "I just wanted to wish you a Happy Birthday. I would never say in your case that you're fired, so I'll just say, you're hired! 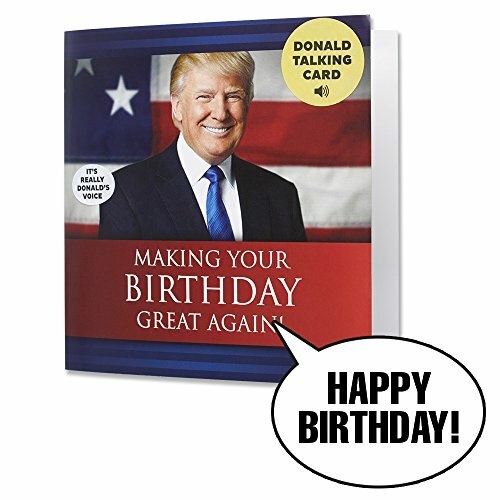 MAKE SOMEONE'S BIRTHDAY GREAT AGAIN! 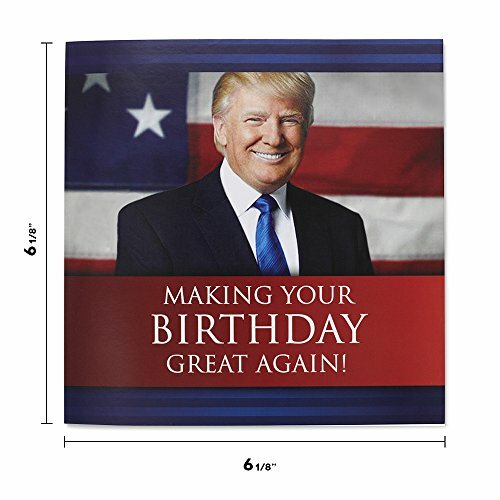 Whether you're a patriot or a prankster (or a patriotic prankster), this is the greatest birthday card you can give somebody. This novelty talking card is a funny gift for both Republicans and Democrats. And even though it's a great gag or prank, the elegance and extra durability of this high-quality, glossy finish card is sure to impress colleagues and acquaintances. 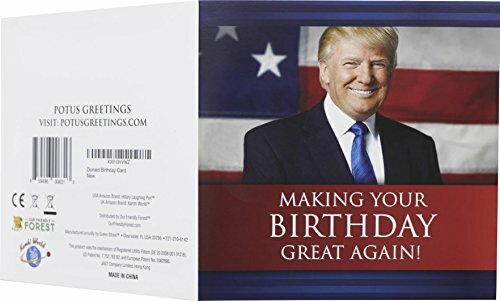 NO RUSSIAN COLLUSION IN THE CREATION OF THIS CARD - Rest assured that Russia had nothing to do with the making of these greeting cards. Funny ideas like these only come from the good ol' USA. Plenty of blank space inside the card for you to add your own words or write custom messages and season's greetings. INCLUDES A "NO LEAKS" MAILING ENVELOPE - Shhh! 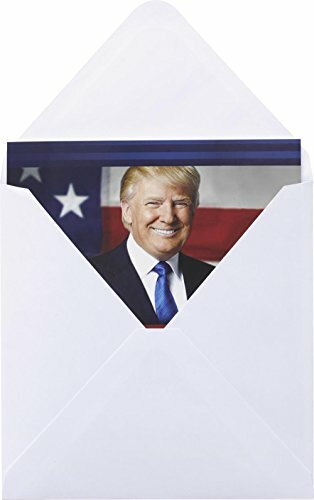 We won't leak to anybody that you're sending this card. 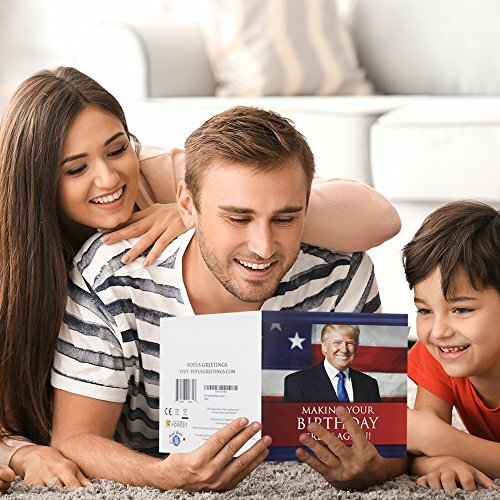 The included envelope ensures you can easily sign, seal and deliver the Trump Talking Birthday Card to a friend or family member. And nobody will ever know. You're welcome.